We had 53 diners at our annual Christmas Lunch at the Yarrow Hotel, Broadstairs on Saturday 8th December. We had an excellent meal, beautifully served by the staff of the hotel, who as ever were excellent. During the course of the lunch Katy Styles MNDA Trustee awarded a 25 year award to Hazel Izzard (Watts) for her service to MNDA in East Kent over the past quarter century. Hazel has retired from our group and we gave her a beautiful bouquet in recognition of the incredible work she has done to support people living with MND in East Kent. As in previous years we had a superb raffle, with prizes being bought along by many diners and we had lots of fun drawing the raffle and the children present certainly had fun collecting various prizes. We would like to thank the Yarrow Hotel and their wonderful staff, all raffle donors and everyone who attended for making it such a splendid lunch. We wish everyone a wonderful Christmas and a good 2019. On Saturday 2nd June the 7th annual Pearson Whiffin Charity 5-a-side football tournament took place at KSports Cobdown in Ditton, Aylesford. The day was overcast but dry, ideal conditions for playing football. 48 teams played several matches each seeking to win the coveted Champions Cup, the cup was won by Macklands with ISS winning the Consolation Cup. 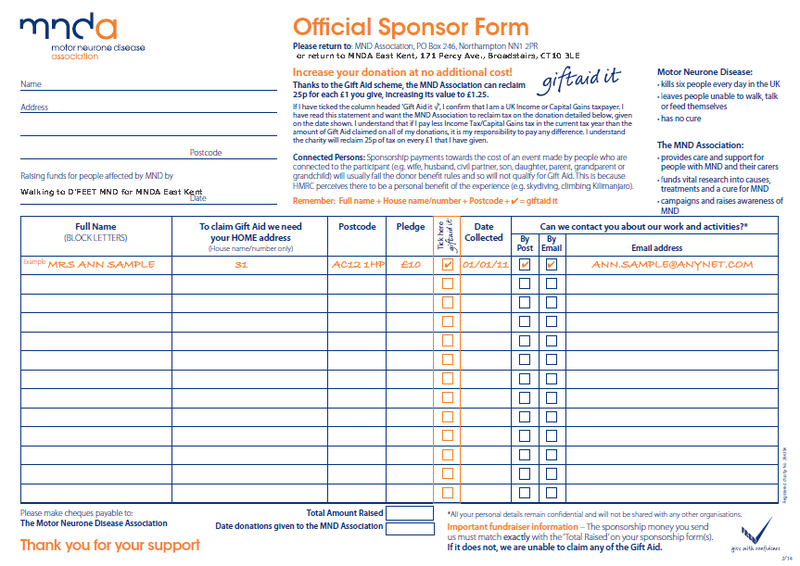 The chosen charity for the day was MNDA in Kent, with all proceeds to be shared amongst the branches and groups in Kent. Through various activities on the day and raffles, Pearson Whiffin raised over £5000 to support people living with MND in Kent. MNDA East Kent warmly thank Rob Pearson and his team for organising this wonderful event and raising funds to support people living with MND in Kent. Please support our sponsors by visiting www.pearsonwhiffin.co.uk for all your recruitment needs. On Sunday 1st July, MNDA East Kent entered a team in the KM Charity Group Dragon Boat Race. Our team was made up of members of the Lawrence family from Folkestone. The team were entered into three races, impressively winning two and coming second in the third race. In our final race, we were pitched head to head with the team from MNDA Mid Kent, who were the fastest team on the day. It was a very close race, we managed to beat Mid Kent but due to their faster times in earlier races they went through to the finals. Congratulations to the team of MNDA Mid Kent! MNDA East Kent has entered a team into the Dragon Boat Race at Mote Park Maidstone on July 1st 2018. Our team will comprise of up to 17 members and will row at least 3 x 1000 metre races. The team competed last year winning both races they entered and we look forward to greater success in 2018. We will be holding a support picnic for our members and members of the other Kent Groups. We hope there will be a great turn out to support us and enjoy a great picnic in we hope, glorious weather. We hope to raise some funds from this day out and ask anyone who wishes to support our efforts to visit https://www.justgiving.com/fundraising/dragonboatrace-eastkent and donate what you can. Huge thanks from the MNDA East Kent Dragon Boat Team and to all our supporters. Kent Company Pearson Whiffen Recruitment are running a 5 a side Football tournament on Saturday 2nd June, starting at 8.30. All proceeds from the day will be shared by the Kent Branches of MNDA. We are looking forward to a fabulous day attending this event and hope to see many of our supporters on the day. Grateful thanks to Pearson Whiffen Recruitment Ltd. for selecting MNDA to be the charity to benefit from this competition. Our Spring Lunch will be held at The Yarrow Hotel, Ramsgate Road, Broadstairs on Saturday 28th April starting at 12 noon. This will be our 5th Spring Lunch and we expect it to as enjoyable as previous years. The cost is £13.50 for a 3 course meal. People living with MND and their carers come as our guests without charge. We look forward to receiving your booking and to seeing you on the day.